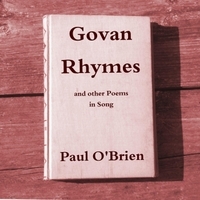 The poetry book "Govan Rhymes and Other Poems" by John Murray (1855-1911) was published in Glasgow in 1913, Paul O'Brien has adapted sixteen of these poems and set them to original music. While on a visit to the Fairfield Shipyard offices In Glasgow during the autumn of 2013 I was show a copy of the book ‘Govan Rhymes and Other Poems’ published in 1913, written by John Murray (1855-1911). Colin Quigley, a member of the ‘Govan Reminiscence Group, had recently acquired it and he wondered if I was interested in these poems from one hundred years ago. Of course I was! It was immediately obvious to me that many of these poems would make good songs. Colin kindly supplied me with pdf copies of the material and I started reading and absorbing the verses, the mood and the content. Theses poems are varied in content and style and they express the aspirations and hopes of a particular community at a particular time, Glasgow at the turn of the twentieth century. Though I myself was born and reared in Dublin’s dockland this is what attracted me most to them. There had been a large influx of immigrants to my own area in the late nineteenth and early twentieth century and the majority of these immigrants came from Glasgow, including my grandparents. These verses were for me an insight into these people and times and I believe them to be a important addition to the series of songs in the “Port to Port” project. Buckhaven for a Holiday: a song in praise of the one-time famous holiday town where John Murray lived in his youth. A Carter’s Blighted Hopes: A humorous look at the wooing prowess of a carter. The Crooked Ways of Cupid: The tale of a young man at first frustrated by Cupid, then rewarded – a reoccurring theme of John Murrrays. The Good Samaritan: A tale of the hardships of a strike. Grousey Glen: A song in praise of one of Scotland’s beauty spots. In Memory of James Evans: A ballad in memory of a hard working tradesman who died as a result of an industrial accident. Iron Brew: A song in praise of Scotland’s ever popular soft drink, still manufacrtured today, though rebranded Irn Bru because of the trade description act, it is not actually ‘brewed’. A Letter: A letter to a landlady in Buckhaven announcing the imminent arrival of a few holidaymakers. The Life boat and Crew: In praise of the Buckhaven Life Boat crew, a popular subject of John Murray. Neilson and his Bride: A love song. The Old Man Outwitted: Another love song wherein a clever daughter outwits her possessive father. The Sandhead Village Belle: A song in praise of a local beauty. To a Lonely Auld Man: Some advice for a bachelor friend. To Maggie: Another gentle love song, this time in praise of a fair holiday maker. The Wee Man I Meet Now and Then: A rather vindictive few verses directed at someone in particular. What is Life? The eternal question, from John Murrays own point of view.